If you’re looking for a cheesy and delicious side dish that pairs well with practically any meat course, look no further. 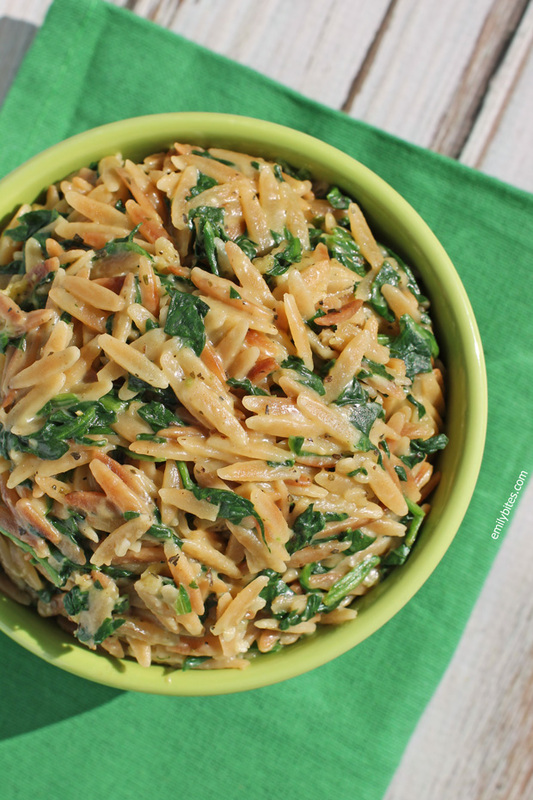 This Spinach and Parmesan Orzo is the stuff dreams are made of (well, my dreams anyway…have I mentioned how much I love food? And cheese?) and it comes together really quickly for inclusion in an easy weeknight meal. My husband loves to grill, and now that ours is no longer buried in snow he is in his element. 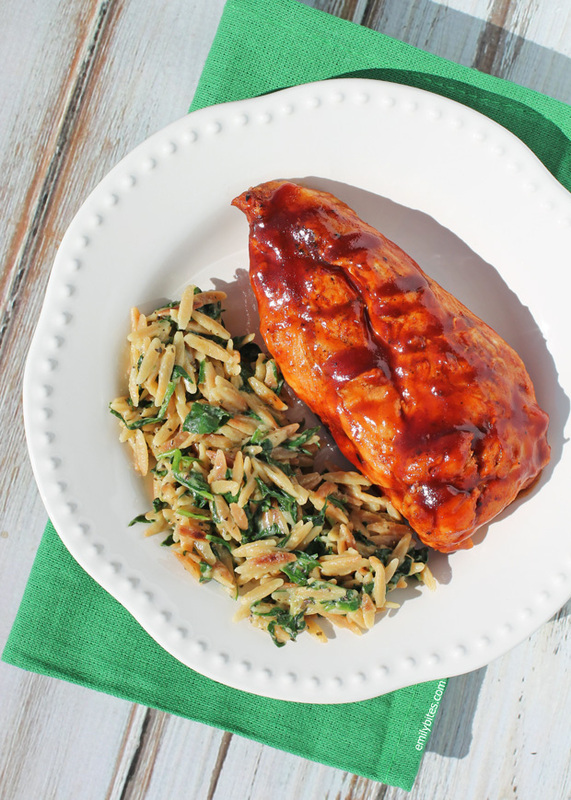 I love this Spinach and Parmesan Orzo because he can throw some meat on the grill, I can easily whip this up in the kitchen along with a salad or some fruit and dinner is served. This is also a great dish to pair with a salad for a light meatless meal or easy lunch. Looking for more ideas for tasty and satisfying side dishes? Check out my Garlic Roasted Green Beans with Almonds, Zucchini Casserole, Loaded Cauliflower Bake, Zucchini Squares, Cheesy Potluck Potatoes, Crispy Corn Fritters, Buffalo Cheese Bread and more in my side dish recipe category! Hey Emily, do you think I can make this with broccoli instead of spinach? Maybe if I blanch it for a minute or two before adding it to the orzo? Thanks, love many of your recipes! Sure, you could definitely add some cooked broccoli instead of spinach. Hope you love it! Debbie, I was thinking the same thing, and I think broccoli would be great! Blanching it first is a good idea. I’d sub arugula, too. And I think blanched asparagus cut into small pieces would be super…fresh asparagus will be appearing at my farmers market before long. Yum! Looks wonderful! I have some whole wheat orzo in my pantry! Made this tonight, it was great! I like that I can sneak a vegetable in on my husband by having it in this delicious pasta dish! We both loved it, thanks for another great recipe! Another awesome recipe! We had this side over the weekend with grilled steaks, and it was fabulous! Having pizza logs (one of our absolute favorites) for dinner tonight. Emily, your recipes and your website NEVER disappoint – thank you! Made this last night. Awesome!! Big hit with the family. They were even looking for leftovers today, of which there were none!! Just made this and it was delish! 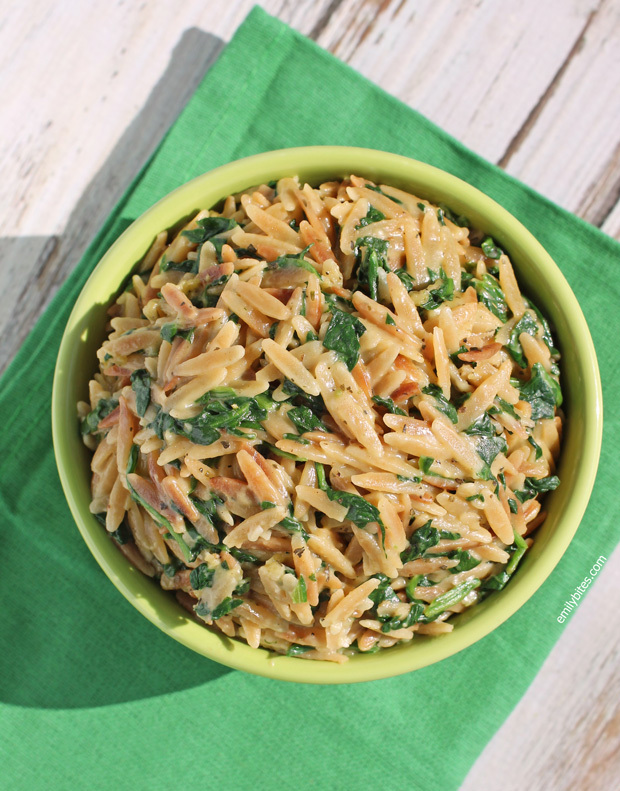 Brought it down to a single lunch portion – 40g orzo, one bag spinach, 20g parmesan, one cup stock. Also threw in a tiny onion (finely chopped) when coating/browning the orzo. I feel full, satisfied and I can already tick “dose of greens” off today’s list! This was fantastic. Came together really simply. Even sent the link to my sister! Thanks for providing healthy recipes!!! Love your site. Made this last night with some greek yogurt chicken – omg. Very delicious! I’m eating some leftover orzo for lunch, and it reheats pretty well. Definitely making this again. Thank you Emily!! As it turns out this is the stuff my dreams are made of too! This was easy and absolutely delicious! The whole family declared it a winner-even one of my “no parmesan” kids loved it. Thanks! If I cannot find whole whear orzo, would that change the points value?